Pair this with my fictional floor plan for Michael Scott's apartment first floor. And add Jim Halpert's floor plan and Dunder Mifflin from The Office for the complete set! 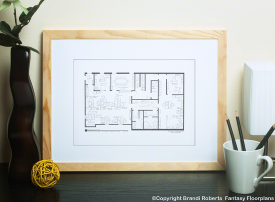 My floor plan is purely fictional and the ultimate gift and conversation piece for The Office!